for use with First Person Shooters. that give the player a constant frame of reference. to place the center of the cross-hairs on the target. 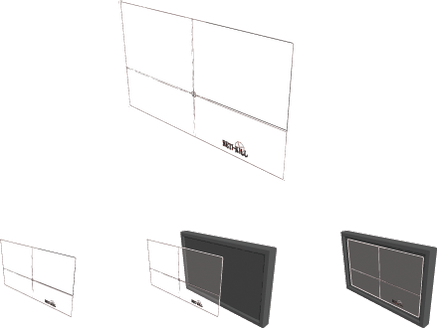 Reti-Kill transforms your entire television screen into a scope. Virtually every gun mounted scope in the world has a vertical line and a horizontal line extending across your entire field of view. THERE IS A REASON FOR THAT. IT'S NOT ALL ABOUT MARKING THE CENTER OF YOUR SCREEN. Otherwise, every gun mounted scope would just have a dot. Why waste time with useless lines that clutter your view? Top marksmen understand that having lines through your entire view gives your brain many more visual reference points, making it much easier and much faster to get the reticle on target. This is why certain top players train with Reti-Kill. In the world of "kill or be killed", the slightest advantage means everything. Elevate your game. Dizziness is caused by motion sickness. Reti--Kill greatly reduces motion sickness because there is a constant horizon line that your eye can focus on. There are lots of people that would love to play FPS games but can't. Problem solved. First off, if you say it's "cheating", then you are also saying that it works. It wouldn't be "cheating" if it didn't help you. Secondly, this is a TRAINING device. For you competitive players: We understand that Reti-Kill is not allowed in MLG or other promotions. The idea is to use Reti-Kill during practice, building your muscle memory so that your reticle is always in the best position when you are moving around the map. Eventually, the image of the Reti-Kill is burned into your mind so that don't need it. For you casual pub players: Playing with a Reti-Kill makes you better so you can have more fun, just like a mod controller, faster TV refresh rate, better internet connection, gaming glasses, gamer grip, etc, etc, etc. How many times have you been killed simply because your connection wasn't as good? Are they cheating? Reti-Kill will get you on target faster, but you still have to pull the trigger.